Jackie is the winner of Round 51. She graduated from UT Southwestern Medical Center of Dallas. She is a published freelance writer, storyteller and elementary educator. She lives in Texas with her husband, two teenagers, and her dog, Ginger. When she’s not teaching, she is traipsing through the worlds of Alburnium or Fae in search of another story. She looks for the extraordinary in the ordinary in everything she experiences. Find a list of her books and anthologies here. 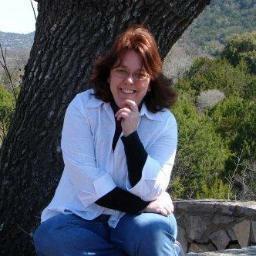 Follow her at her author blog, her book series site, and on Twitter. Withered fingers dig into the damp soil mixed with decayed leaves. Breathing in a lung-full of earthy richness, he sighed. Bones creaked as his head rested against upon the earthen bed. Emerald fronds waved over his face in the breeze. The tiny veins interweaving along the ferns underside were a shadow of his long life lived. A series of crossed paths and chance meetings, journeys down twisting and turning roads. In the end, they all returned to the earth and she welcomed them, making them a part of her core. Above, black branches decked in yellow shimmered against the blue expanse. He contemplated his folly. The incessant planning, scheming, striving… only to return here in the end. He should have simply breathed in… and out… and in… and…. Release from the earth’s constraints. Bindings broke. He extended wider and wider to accept what lay beyond. Free.